The following recipe is for a dish that is both vibrantly colorful and wonderfully flavorful. Don’t be intimidated by the four jalapeño peppers — if you remove the seeds and white membrane from inside the peppers, they hardly have any heat, especially when cooked a long time, so it’s a very mild dish. If you want it to be hot, however, leave the seeds in one or more of the jalapeños, or add some crushed red pepper or a dash of cayenne at the end of the cooking time. Guacamole with tortilla chips would make a nice accompaniment to this dish. One thing of which we are all relatively certain here in the U.S. is that European settlers learned about corn from American Indians. Right? Well, not really. 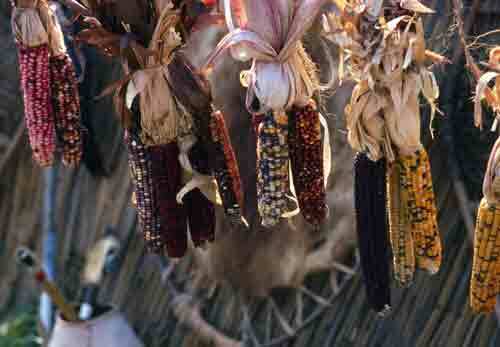 What they learned about from the indigenous peoples of the New World was maize, not corn. Sound like double talk? Well, as it turns out, the word corn may not mean what you think it does, at least not if you’re an American. The term corn actually means the most important cereal crop of a region. Hence, wheat was traditionally the corn of England, oats were the corn of Ireland and Scotland, rye was the corn of northern Germany, and in South Africa, the grain known as Bantu corn is millet. The term can also mean small, hard seed, which is why the seed from barley is often called barleycorn. When settlers reached the New World, they called the grain grown most commonly by the Native Americans “Indian corn.” Which explains why, even though no one in Europe had seen maize before they reached the Americas, you see references to corn in older literature. Only in the United States is the word corn used to denote maize alone. For soufflé making, in addition to the usual pots, cups, and measuring spoons, you must have a metal or ceramic bowl (never plastic), a rubber spatula, and a whisk. An electric mixer is pretty much a requirement, as well (I’ve actually beaten egg whites by hand before—so I know it works, but I also know it’s a daunting amount of work). A soufflé dish is nice, but not required; you just need an oven-proof dish of some sort, 1 quart capacity for this recipe, or double the recipe, if all you have is a 2-quart baking dish.